Rotary Spindle enables EDM turning of microstructures. Combination of Model H80R.MAC Rotary Spindle and Model H1680.AC4 variable-speed ac control enable production of miniature round parts. Contour shapes are programmed into EDM control, eliminating contoured wheels. Spindle and refined generator settings allow EDM turning of diameters down to .002 in. with surfaces to Ra 0,2. 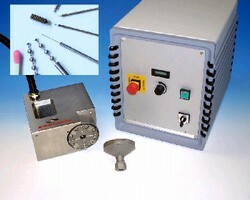 Applications include ejector pins for micro molds, miniature valve slides, electrodes for sink EDM, and micro pump parts. HIRSCHMANN Engineering U.S.A., Inc., Buffalo Grove, Illinois, announces a breakthrough in EDM turning of microstructures. The newly designed H80R.MAC high speed rotary spindle combined with the H1680.AC4 variable speed AC control, has made the production of miniature round parts with small diameters and finer finishes possible. The H80R.MAC incorporates special bearings, minimum radial run-out and variable high-speed control. Unlike grinding, there are no side forces from wheel contact. Smaller diameters without deflection are possible. In addition, contour shapes are programmed into the EDM control, eliminating contoured wheels and reducing set-up times. Some of the product uses are: core and ejector pins for micro molds, medical applications, miniature valve slides, electrodes for sink EDM, and micro pump parts. Developed in conjunction with the Institute for Mikrotechnik Mainz GmbH, Germany, this new spindle along with refined generator settings of the wire EDM, allows the EDM turning of diameters down to 0.05mm (.002") with surfaces to Ra 0,2. The H80R.MAC Rotating Spindle and H1680.AC4 Speed Control Unit are available for delivery. Complete illustrations of all rotary tables and axes are available in the NEW free catalog RE 4905, Stainless Steel Rotary Indexing Tables and A-Axes for Wire and Sinking EDM. Incorporated in 1992, Hirschmann Engineering, USA, Inc. is a subsidiary of Hirschmann GmbH, Germany, a privately owned ISO 9001 certified company founded in 1957. Hirschmann Engineering USA, Inc. is the sole importer of all products manufactured by the parent company and by Oelheld GmbH, a producer of synthetic metalworking fluids. Oelheld is an ISO 9001 certified company, founded in 1887. Hirschmann Engineering USA, Inc. is responsible for sales, service, and technical support for all of North America.